Picking up the trail of Harvey Mitchell (also styled Harvey Michel, at least by his immediate family after the American Civil War), off we go again. In the 1850 federal census, Harvey Mitchell (ca. 1801-ca. 1863) is listed as 52 years old, which would push back his year of birth to around 1798. However, age estimates rendered in census records are notoriously off the mark. Still, it also lists Jane (Wood Johnston) in the same household, children Louisa, William and Susan; head of household is Thomas P. Mitchell, presumably one of Harvey's brothers or cousins. Thomas is listed as a farmer; Harvey is listed as having no occupation -- an unkind cut on someone's part. Although not exactly a wealthy man, still he was probably tutoring, teaching, and possibly painting portraits for hire. Place: Bedford (formerly Liberty), Virginia, located about twenty miles to the west southwest of Lynchburg. In any case, this situation changed within two or three years. 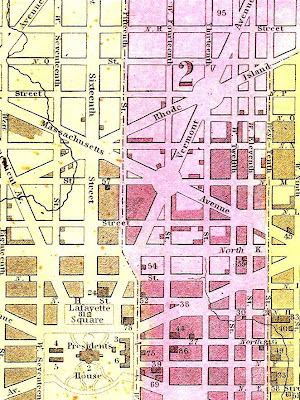 In The Washington and Georgetown Directory, compiled by Alexander Hunter (Washington: Kirkwood & McGill, 1853, page 71), Harvey Mitchell is listed as Clerk of Pension Office, living at the north side of Massachusetts Avenue, between 13th Street and 14th Street West in Washington, D.C. So he'd gotten a government job, probably with the help or guidance of Jane's brothers Edward William Johnston, then living in Washington City, and Joseph Eggleston Johnston, who often came to Washington on business for the Corps of Topographical Engineers and War Department. A close examination of pension records from this time would probably come across Harvey's signature on numerous pension documents. The 1860 federal census has Harvey Mitchell and immediate family still in Washington, D.C., and Harvey still working for the federal government, but in a different capacity. More on that and his household in the next installment. 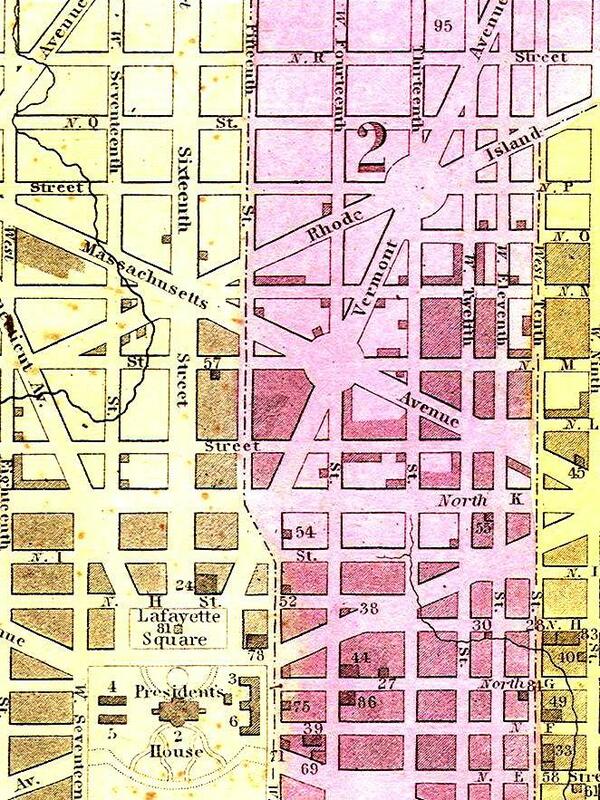 Image: closeup section of Washington, D.C. map published by Samuel Augustus Mitchell (Philadelphia, 1850). I've been reading through my grandfather's aunt's letters. As a child, she lived in Washington DC during the Civil War. And in a letter written in 1927, she thanks my grandfather for putting her in touch with Nellie Binckley who was a childhood friend. She writes,"we are both old women now, but when we were children, both being only girls we were inseparable and we wrote to each other for many years...." My grandfather's aunt was named Mia Suverkrop. She moved to Great Britain as an adult and never married. that's such great sychronicity! Thanks for sharing. Another piece in the great puzzle.